A beautiful Mushroom Coral is often the first addition to a new reef aquarium because they are some of the easiest reef animals to keep! What do Mushroom Corals Look Like? The surface of their oral disc can be smooth, bumpy, or fuzzy in appearance. They come in a wide range of colors including green, red, purple, blue, and gray; and can be a solid color, have stripped lines radiating from the center, be spotted, or even mottled. These eye-catching beauties are a favorite of all reef hobbyists. Mushroom Anemones are great for beginners because they are not only attractive, but are very hardy and undemanding. They can be kept in most reef tank type set-ups with low to moderate lighting, and low water movement. They will reproduce quickly in well cared for systems, and are relatively inexpensive. A great nano coral, the Bubble Mushroom as Sealifebase calls it, the Warty Corallimorpharin. You can call it the Bubble or Warty Mushroom for short! Needing a tank that is at least 5 gallons, small fish may be in danger. The Bubble Mushroom usually comes in translucent green, blue, yellowish green, purple-mauve, green, brown and orange with contrasting and possibly iridescent tentacles. These tentacles will form rounded vesicles or they may elongate to take on a fuzzy appearance. Like other mushrooms, the tentacles do have toxins in them so in large numbers you may need carbon or other toxin removal products in nano tanks. They are great for nano tanks and beginners but do need slightly better water conditions than most mushrooms. The Bullseye Mushroom is probably the most sought after mushroom coral due to its variable coloring and harmless nature when it comes to fish. Yeah, we have all heard the stories of someone's large mushroom eating a fish! Well, the Bullseye Mushroom Coral will not be guilty of such an action and are great for nano tanks with nano sized fish! They are tolerate of less than pristine water conditions and are great for beginners! The Bullseye Mushroom is easy to care for and prefers dim to moderate light. Water flow should be low enough so they can catch the food they are being offered. As you see in the video, the water around the mushroom is very low, allowing the Bullseye to close around the food. Typically they only grow to 2" so they are a great nano tank coral. Sometimes mistakenly called "fish eating mushroom," which DOES encompass mushrooms with long tentacles, this species, Rhodactis mussoides will not. Clearly, by watching the video, this mushroom, while very large, does not have the grip factor of the dangerous mushrooms. Similar to Ricordea, this particular species of Rhodactis can have multiple mouths. The "tentacles" are short and stubby and the edges are ruffly and at times this mushroom likes to fold onto itself. Growing up to 15," provide them with a tank that is at least 20 gallons or more. The Florida False Coral, more often referred to as the Ricordea Mushroom, is a close relative of the Knobby False corals or Yuma Mushroom, Ricordea Yuma. In the wild, their coloring seems to depend on the water quality, light and temperature; being various shades of orange in the summer and in the winter they tend to be green and blue. During storms they are transparent at times! These are great for a nano tank and they reproduce and form colors that can be different from the mother mushroom, providing the aquarist with a rainbow of colors! Of course, one can buy a mix of colors from the start! With more than one mushroom coral being referred to as "Elephant Ear," it can be confusing, however this particular species, Amplexidiscus fenestrafer, will eat your fish. It is easy to tell the difference since they have quite long tentacles and the outer margin is lacking tentacles. They can close up around a fish or invert that dares to venture too close with in 3 seconds, using their tentacles to sting the victim. They do not close fast if the food item is not alive or if they are kept well fed. They have the ability to take down a fish as long as they are! Provide 50 gallons or more. Finding what seems to be the only Discosoma howesii on you tube, alas, its a floater. This does not appear to be a hairy mushroom since the tentacles are not dense enough. If the identity is wrong, this video still gives a valuable opportunity to show what happens when your mushroom coral is not happy. It can be a lighting issue, flow, water quality or it is being chemically chased off by another mushroom. This floater seems to match the description of a D. howesii, having spaced fuzzy and thin tentacles, very short foot and the color is right on the money! The Green Hairy Mushroom is from the Rhodactis genus, which tends to grow larger than the Discosoma genus, reaching up to 8" in diameter. Rhodactis do not have stinging tentacles, so they are the perfect low maintenance host for your Ocellaris or other "any port in a storm" clownfish. The Green Hairy Mushroom is easy to feed and does not typically eat fish. This clownfish is having a hard time getting food to his mushroom and it is quite amusing to see all the fish trying to steal his food! The Mushroom Anemones are often called 'false corals', Coral Anemones, Mushroom Corals, Disc Anemones, and Mushrooms. They are saltwater cnidarians. Though originally grouped with the so-called "true" anemones" in the order Actinaria, in 1937 they were separated out and placed in their own order. They now belong in the order Corallimorpharia, so as a group they are also commonly referred to as Corallimorphs or Corallimorpharians. The taxonomical identification of mushroom corals has a history of limited and dated information which is often of dubious value and sometimes incorrect. Unlike corals that possess sclerites to provide a fossil record, mushrooms corals have no fossil record. Physical aspects such as the type and number of nematocysts present, the thickness of the mesoglea, number and distribution of tentacles and nesenteries, the coloration, and so on, have also proved to be not very reliable for identification. Modern methods using DNA and RNA testing to deduce the sequence of genes, though more reliable, are not yet readily available. The Corallimorpharians are not on the IUCN Red List for endangered species. The four families in the Corallimorpharia order are listed below, as well as the most familiar and commonly available species in the genera Actinodiscus, Discosoma, Ricordea, Corynactis, Rhodactis, and Amplexidiscus. Specifically, C. californica was described by Carlgren in 1936. The Amplexidiscus genus was discovered by Dunn and Hamner in 1980. The Rhodactis genus was discovered by Milne, Edwards, and Haime in 1851. A pendulum of mushrooms, the Rhodactis genus has reclaimed several of their original Taxonomic members from the Discosoma genus. However, currently R. howesi and R. rhodostoma are also listed under the Discosoma genus. The Ricordea genus was discovered by Duchassaing and Michelotti in 1860. Coral Mushrooms are found throughout the world's oceans. Most are found in tropical waters, but there are also cold water species. They inhabit a wide variety of marine environments, though most often in areas of poorer water quality. Mushrooms are considered 'phase shift' corals. This is because they are frequently secondary colonizers on dead reefs that result from both natural disasters and man-made pollution. Found singly or in colonies, many specimens are collected from brightly lit shallower waters with less turbulence, but some are also found in deep, shadowy waters. Actinodiscus - The Actinodiscus genus are found in the Caribbean and the Indo-Pacific oceans in low current, and shallow to mid-depth waters. They prefer the shaded areas, indirect sunlight, although some are found in shallower brighter waters as well. The Actinodiscus genus like to grow on dead corals, rubble, and between coral heads. Discosoma - The Discosoma genus are found in pretty much all reefs in the Caribbean and the Indo-Pacific oceans in low current, mid-depth waters. They prefer the shaded areas of the reef. The Discosoma genus like to grow on dead corals, rubble, between coral heads. Ricordea - The Ricordea genus are found in the Atlantic and the Indo-Pacific on rocky surfaces, rubble, or growing vertically on dead corals. They can be found at various levels, from deep waters to shallow waters. Both are found in faster moving water than other mushrooms. 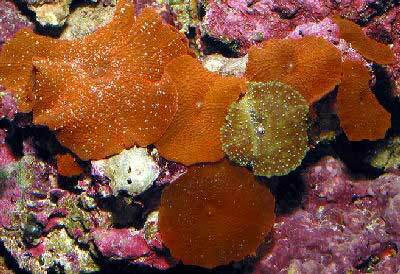 Corynactis - The Corynactis genus are found in the Eastern Pacific and North Atlantic oceans in temperate waters. There are only a few that are from tropical waters, but are rare and not as available to aquarists. Sometimes they are found attached to live rock, although are also found in sandy and rocky areas near the reefs in various depths in groups. Rhodactis - The Rhodactis genus are found in the Central Indo-Pacific Ocean in shallow, bright waters down to low light areas of the reef as well. The Rhodactis genus like to grow on dead corals, rubble, between coral heads. Amplexidiscus - The Amplexidiscus Genus are found in shallow waters that are anywhere from quiet to turbid, in areas of sub tidal coral reef lagoons in the Indo-Pacific. They are found alone, and at times in clusters. They like to grow on dead corals in a vertical formation, as well as on rock. Corallimorphs are a peculiar group in the Anthozoa class. Externally they resemble sea anemones, while internally they are structured like the stony corals in the Order, Scleractinia. Yet Mushrooms are peculiar because these are corals without the hard calcious skeleton found in the stony corals. They also lack the long predatory feeding tentacles. Like the sea anemone... Mushroom Anemones have a body stalk or column, which is quite short. On the bottom of the column is a pedal disc used to adhere to substrates and on the top of the column is an oral disc covered with tentacles. Unlike most sea anemones, their tentacles are quite reduced and are not retractable. The tentacles usually consist of two types, those along the outer margin and those on the top of the disc. The surface of the oral disc can appear almost smooth or be nibbed with small bumps that can radiate out from the center in concentric circles. Similar to stony corals... the ends of the Mushroom Anemone's tentacle bumps are laden with stinging nematocysts. They can be either sticky, atrich-type nematocysts, or penetrating types. Stony corals use special penetrating nematocysts, called spirocysts, but these are generally lacking in Mushroom Corals. Due to being short and lacking spirocysts, the Mushroom's tentacles are not used for aggressive prey capture, rather they are used to feed on food particles that land on the surface. Even specimens with slightly longer tentacles are not really efficient enough to capture roaming prey. The mouth of a Mushroom Anemone usually protrudes or extends outward while on sea anemones and stony corals it is usually flat or projects inward. The broad oral disc is flexible with a heavy mucus coating and tiny cilia that help move food to the mouth. Actinodiscus - Imagine a coral that can morph its size, surface texture, and color! This of course, depends on light and water movement. The Actinodiscus genus come in many colors and textures, even within their own species. It's no wonder the taxonomy for mushrooms is ever changing. On top of that, they are so easy to care for and so easy to find, everyone has some! The challenge is getting all the different species for a really cool display. The Actinodiscus genus can be smooth, ridged or have small bumps on the surface, and their mouths protrude in the middle. They come in red, blue, green, and can have stripes, metallic shades, and a variation and combination of all colors. Their little "nubs" or ridges can be different colors. Some names they are known for are Disc Anemones, Mushroom Corals, and Mushroom Anemones. Discosoma - Here is a coral that is happy to eat the nutrients you don't want in the water anyhow! The Discosoma genus is almost the perfect coral, and is the easiest of corals to care for. Great for nano tanks, all the way up to huge full blown reefs. They come in a rainbow of colors and prefer low light and low water flow. Another bonus, you do not have to feed your mushrooms. They will warp their body and force small particulate matter into their mucous center for absorption. They propagate easily in captivity, and you can cut them in 1/2s and 1/4s to sell as frags. The Discosoma genus can have small bumps, warty or small tentacles on the surface, and their mouths protrude in the middle. They have various colors within their body, including brown, purple, white, yellow, gray, dark green, green, and blue. These contrasting colors are found in the tentacles, tentacle tips, and body color. Some names they are known for are Disc Anemone, Metallic Mushroom, Bubble Mushroom, Warty Mushroom, Forked Tentacle Mushroom, Umbrella Mushroom, and Mushroom Coral. Ricordea - This is one of the most sought after types of mushrooms due to their brilliance and the variety of colors available! The Ricordea genus fetch a Hefty price if the color is intense, yet once they multiply, the hobbyist can recover some of this cost. Water movement plays a part in color and propagation, as does lighting. Changes in lighting and your new mushroom may display a different shade than you thought you were getting. The Ricordea genus comes in several colors that at times can be dull, but are usually bright or even fluorescent in intensities. The grape like tentacles can be a variety of combinations of colors or just one solid color of red, green, yellow, orange, brown, purple, muted pink, or green. The body, tips of the tentacles and even the mouth can all be different colors as well. The tentacles around the margin of the mushroom can be longer which would aid in grabbing food. They do not have a potent sting, but direct contact to another coral will still cause damage. At times the area around the mouth opening will be a muted color. The mouth opening of the Ricordeas with more than one mouth tend to be more oval than round. Some species have verrucae that also cover this oral protrusion. Corynactis - The cold Corynactis is an amazing variation to the Corallimorphia family! Only a few relatives live in warmer waters, but for the most part, chillers are essential. The Corynactis genus has some incredible color combinations. The oranges, greens, pinks, and reds, which can be almost fluorescent, look so cool with the animals that have clear tentacles and contrasting colored tips. Even those tentacles can have tentacles. This is truly an amazing animal that will be a great addition to your cold water aquarium! The Corynactis genus has a surface that is covered clear to white tentacles that have club shaped or fringed tips. They can be white, pink, red, orange, green, and clear in color. These corals are closely related to stony corals with basilar muscles, and are less like anemones except for the fact that neither have a calcareous skeletal structure. They grow only to 1" (2.5 cm). The C. californica is bright red with clear to white tentacles with fringed tentacle tips that can be white or clear. Some names they are known for are White Ball Corallimorph, Orange Ball Corallimorph, Jewel Coral Anemone, and California Coral Anemone. Rhodactis - Rhodactis are great for a reef with higher lighting intensities, and so cool to feed! The Rhodactis genus is a larger and more "hairy" mushroom coral. Depending on the species most thrive in high light conditions so are great for a reef with higher lighting intensities. The oral disc surface of the Rhodactis genus is covered with short, split-ended tentacles that are called verrucae. They are arranged radially, thus giving them a fuzzy or hairy appearance. The various colors within their body include brown, purple, green, white, rust, with some having a pink or white mouth. These contrasting colors are found in the tentacles, tentacle tips, mouth and body color. Some names they are known for are Elephant Ear Mushroom, Hairy Mushroom, and Metallic Mushroom, Mushroom Anemone, and Hairy Mushroom Anemone. Amplexidiscus - Amplexidiscus are great for a predatorial reef with large fish that cannot be consumed by this mushroom! With smaller fish, the Amplexidiscus species has a nasty reputation for eating the little guys that venture too close... and these 'little guys' can be a 6" fish. This species is actually quite tricky. Mimicking the carpet anemones (Stoichastic sp.) has proven useful, as unwary clowns think they have found a host only to be consumed. Another trick is to close almost all the way and fool a fish into thinking it has found this SWEET cave to hide out in, only to have a rude awakening as this purse shape closes quickly around this tasty meal. The Amplexidiscus Genus has a surface that is covered with beadlike verrucae that is sparsely spattered across the surface. When the animal contracts, these will form into short lobed tentacles around the margins of the disc. The various colors within their body include brown, ivory, green and greenish gray that fade in color toward the outer edges. The mouth may be orange. The distinguishing feature that helps to identify this genus from the Rhodactis or Discosoma genus, is that their outer edge is almost translucent and does not have verrucae. When feeding, the mouth remains closed until the entire oral disc is closed. The mouth then opens and consumes the prey and will close again before opening up again. Some names they are known for are Elephant Ear Mushroom, Hairy Mushroom, Mushroom Anemone, and Giant Elephant Ear Mushroom. The ability to tolerate changing environmental conditions, makes Disc Anemones well suited to captivity. A hardy fish / invertebrate type marine aquarium or a reef aquarium works well for Corallimorphs. Like most anemone species, they need live rock or some other solid material they can attach to. Water changes of 10% bi-monthly or 20% a month are typical for most anemones. Mushroom Anemones do not do well with strong water movement, so direct the powerheads and intake nozzles away from them. Those from temperate or cold waters, like the Corynactis californica, will need a chiller added to the system. They tolerate a wider range of water conditions than other corals, but excessive amounts of phosphates and nitrates are detrimental. These can be controlled through mechanical or chemical removal, as well as adding plants to the aquarium. Various Caulerpa species work great for this. The Actinodiscus genus is easy to care for and does not like or need high levels of light. They should be kept in shaded areas in tanks with high output lamps, if not they turn all brown and fail to thrive. Some will just float around the tank until they find a nice shaded area. They also cannot handle high water flow, though they can handle higher levels of nitrate than the SPS and LPS corals. The Discosoma genus is easy to care for. They like low to moderate levels of light, depending on the species. If your lighting is too high, they will turn all brown and fail to thrive. In that case, locating them in a spot with less intense lighting will bring them around again. Otherwise, they will turn all brown and fail to thrive, or will just float around the tank until they find a suitable spot. They also cannot handle high water flow. The Ricordea genus is the "odd ball" of the mushrooms. Unlike the rest of the mushroom families, Ricordeas like higher lighting and faster water movement. The Ricordea genus is moderate to care for and can tolerate more light than other mushrooms. Though depending on the species, they do differ in their light requirements. They don't multiply as quickly or thrive under direct Metal Halides, so indirect light would be suggested. They also can handle moderate to high water flow due to the fact that they grow so tightly against the surface they are on. If their lighting and/or water movement preferences are not met, they will just float around the tank until they find a suitable spot or have an unpleasant encounter with a pump. Like other mushrooms, they can handle higher levels of nitrate than the SPS and LPS corals. The Corynactis genus is from warm and temperate waters. The warm water species are easier to care for with basic mushroom husbandry. The cold water species are moderate to difficult to care for since they need cool temperatures that would require a chiller. The Corynactis species also cannot handle high water flow and need very little light. They need to be hand fed at night as many are nocturnal. There is not much information on several of the species, yet general good husbandry, water quality, temperature and appropriate feedings are basic. The Rhodactis genus is easy to care for and most like moderate to high levels of light depending on the species, although in general, high light is not a requirement. R. inchoata is the only one that likes lower light levels. If the lighting is not their liking, they will fail to thrive and/or shrink. They can easily be brought back by changing their position in the water and by extra feedings. They also cannot handle high water flow, although they can handle moderate they prefer low velocities. The Amplexidiscus genus is easy to care for and is not finicky as far as light and water movement, although it does better in moderate light. If they float around and are not doing well, they can easily be brought back by changing their position in the water and by extra feedings. Lighting is important but When illuminating the aquarium for Mushroom Anemones, each species natural environment comes into play. Generally Corallamorphs offered for the aquarium prefer lower light levels, even indirect lighting. However some specimens collected from shallow waters will thrive best with intense lighting. Many hobbyists suggest adding actinic to the lighting mix, as the bluish light can greatly enhances their colors. Those specimens that are collected from greater depths won't have much tolerance for metal halide lights. Many of the Corallamorphs have a symbiotic relationship with a marine algae known as zooxanthellae, and they receive the majority of their nutrients from it. However they can also absorb food particles directly or transport them across the mucus coated surface to the mouth. A few of the larger species, like some of the Rhodactis and Amplexiduscus, can actually capture prey and sometimes fish, by quickly folding in the outer edges of their oral disc and closing up into a sack. In the wild, Corallimorphs feed on a wide variety of foods. Those from shallow waters that contain zooxanthellae need little feeding. Others will feed on dissolved and particulate matter, some feed on zooplankton, and larger specimens are known to trap and digest fish. Mushroom Anemones have been known to go for months without dedicated feeding, and it is important not to overfeed them. In nature, the Discosoma genus feed off micro particulate items in the water column and some can catch small prey with their short, yet affective tentacles. In the aquarium they will eat suspended micro particles out of the water column as well as small fish, depending on the species. They can be fed newly hatched artemia once in a great while. The Ricordea genus feed on small particulate in the water column in nature, and get much of their nutrition from the light and their symbiotic zooxanthellae. They do not feed as readily as other mushrooms. They tend to be a bit picky, but will eat live black worms. Other items you can try are Cyclo-peeze, newly hatched brine shrimp, and other similar sized foods. The cool water Corynactis species needs to be hand fed small pieces of raw fish, shrimp, mussel flesh, and tubifex worms. Feed 2 to 3 times per month. Warm water Corynactis species need to be fed the same foods several times a week to encourage division. In the wild, the Rhodactis genus feed on fish and crustaceans seeking what looks like good shelter, By luring them into their partially closed "purse-string" like enclosures, once inside, the Rhodactis will just close up and consume their prey. Larger particles are also trapped on the mucous laden hairy surface when fully open, and are then consumed in the same manner. Rhodactis species can be fed small pieces of fish and crustacean flesh as well as pellet and flake, though pellet and flake are not suggested on a regular basis. Feed as often as they will close up around it and eat. The more your feed them, the faster they multiply if that is your aim. If the water is moderate, you may have to hold the food in place until the mushroom gets a chance to close around the food. Hold lightly and do not press into the mushroom. In nature, the Amplexidiscus genus use the light and their symbiotic zooxanthellae for nourishment, yet commonly feed on fish and crustaceans as well. It is thought that they use a scent to lure them to the mushroom. Although they have zooxanthellae to get their nourishment, they can be fed pieces of fish and crustacean flesh when smaller. When they grow larger they can be fed whole thawed fish such as silversides. Keeping them well fed in a tank with fish is a wise idea. They feed at night, so right after lights out, you can easily pop some dinner in their mouth. Feed as often as they will close up around it and eat. The more your feed them, the faster they multiply if that is your aim. Interestingly, their feeding response will not happen with any touch, but only the touch of prey, indicating a chemical response is needed, not just any touch like your finger or another object. In the aquarium Mushroom Corals get along with many different types of fish and invertebrates. But to be safe it is best not to include the typical coral eating/bothering type tank mates, such as triggerfish, puffers, large angelfish, and urchins. Some of the larger Mushroom species in the Rhodactis and Amplexidiscus genera have been known to capture and eat fish. Mushrooms Anemones don't move around but they must be placed at a distance from other corals and invertebrates, otherwise there can be a "chemical" warfare. This will usually cause one of the species to not eat, shrink and eventually die. Keep an observant eye on them because even though they stay put quite well, they can reproduce rapidly and encroach on their neighbors. Mushroom Anemones will tolerate their own species and usually other Mushrooms. In the wild many species of Mushroom Corals occur together in large groups. Coral Anemones have four forms of reproduction; budding, laceration, division or fission, and sexual reproduction. Asexual budding, laceration, and division are successful in the aquarium, as most hobbyists soon discover. It has been stated that the warmer end of their temperature spectrum encourages reproduction. Budding: Here individuals are formed from particles divided off from the pedal disc. This is when the mushroom will allow a small piece of totipotent tissue to grow and form from the parent, which in turn becomes a new animal. Laceration: Laceration happens when they move slowly over the surface and leave behind small pieces that will eventually form into mushrooms. Division / Fission: Similar to budding, fission is where an individual divides down the center and forms two animals. They basically split themselves right in half at the mouth and will then wrap back around themselves to create 2 smaller versions within a few days. Sexual reproduction: Sexual Reproduction is where eggs and sperm are released into the water column. They unite and form free-swimming larvae which are initially plankonic, and them settle and adhere to the substrate. Sexual reproduction has not been well documented, and has not been observed in captivity. Presumeably modern filtration methods are inhospitable to free swimming larvae. Mushroom corals can be easily propagated in captivity. Using sharp scissors or a scalpel, cut the mushroom in half right down the center, through the mouth. If a second cut is wanted, take one of the halves you just cut and cut again through the mouth. Place the mushrooms on loose rubble in water flow that is weak to very low. It would be suggested to do this in a small "recovery" tank with the same water as the main display since they may get lost and they also will be exuding a lot of toxins from their little surgery. This will allow them to reattach to a piece of rock and heal, then at that point, they can be moved to the main display. Within a few days all of your "cuts" will become new mushrooms. They can now be glued, sewn or pinned where you would like, if they have not attached to the rubble. The smell you will experience are the toxins these animals use for pushing other corals out of their growth path. It would be prudent to wash your hands if you didn't use gloves. The Ricordea genus propagates easily, yet depending on genetics, can sometimes multiply slowly in captivity. Swifter water movement may speed up propagation. The Amplexidiscus genus also propagates easily in captivity. Just keeping it well fed with frozen or fresh feeder fish and crustaceans will cause it to multiply quickly. Actinodiscus - The Actinodiscus genus can be found easily online and at pet stores as well as frag farmers and most reef clubs. Online they are $29.00 USD or more, depending on the size and color. Discosoma - The Discosoma genus can be found easily online and at pet stores as well as frag farmers and most reef clubs. Online they are $29.00 USD or more, depending on the size and color. Ricordea - The Ricordea genus can be found easily online and at pet stores as well as frag farmers and most reef clubs. Many color morphs are available from captive breeding. Online they can be $8.00 to $75.00 USD for a single polyp depending on the color. Corynactis - The Corynactis genus are very difficult to come by and pricing is not possible at this time. Rhodactis - The Rhodactis genus can be found easily online and at pet stores as well as frag farmers and most reef clubs. Online they are $29.00 to $99.00 USD depending on the size of the rock they are sold on. Some may sell them individually as well. Amplexidiscus - Many of the Amplexidiscus genus are bred in captivity and are easy to find. A. fenestrafer currently is the only imported species from this genus. It is usually found under Giant Cup Mushroom and not the scientific name. The Amplexidiscus genus can be found easily online and at pet stores as well as frag farmers and most reef clubs. Online they are $48.00 USD or more depending on the size and color.